Editor’s Note: This feature is sponsored by ICEMULE. Load up any box cooler with ice and a case of beers and you’ve guaranteed yourself that getting those refreshments down to the beach, whether it’s walking down a cliff or hauling it to a campsite, is now a two-person job. Slinging the same thing over your shoulder, on the other hand, seems like a dream luxury in these moments. The more portable you can make a cooler, the more places you’re going to be able to bring it with you. It’s a pretty simple realization we don’t often come to terms with until we feel like our hands are about to be ripped from our arms and we’re contemplating leaving all those surf sodas behind for a hobo to enjoy. It doesn’t take a rocket scientist to figure this all out. Lugging a coffin-sized box filled with ice, beer, and meat isn’t going to be very functional for a weekend camp/surf trip in any place your Prius won’t be parked 50 yards away from the waves. For this reason, it’s a bit of a surprise insulated backpack coolers weren’t so common long ago. To test all this out, the creative folks at ICEMULE who are aware of this sent one of their soft coolers to The Inertia headquarters. 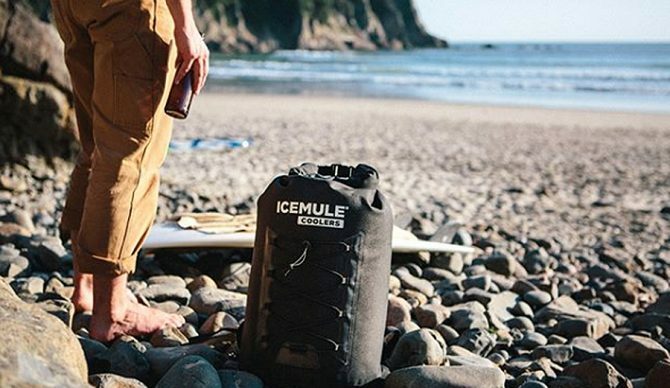 The ICEMULE Pro LG is a 23-liter soft cooler that’s really just a giant insulated rolltop backpack. I’ve been packing my lunches and drinks in it for day trips to Trestles, where the 20-minute walk from the highway to Uppers has always meant bringing more than just some protein bars and trail mix was out of the question. It’s comfortable enough that I’ve been able to load it up, make the hike, and spend an entire Sunday on the beach stocked up on food. In the past, I’ve always been so starved by baking in the sun for an afternoon that just a 2-hour session before packing it up and making the journey back was the norm. At a $99 price point, I’d say it’s worth the payoff of convenience over time for a quality cooler. In Costa Rica, you really only need two things: an off-road moto and a backpack cooler full of cerveza. @willandthewater doing it right. How you pack and close the ICEMULE is key. Since this is a roll-top pack, you’re actually afforded more flexibility in how much you do or don’t pack into the ice mule. Technically, the pack I used is said to fit 24 beers and ice, but with just a little bit of ice and a couple of meals for my own day trips to Trestles, I pack the roll top even tighter and still keep everything fresh by eliminating any extra space. That wider range of use from a rolltop is pretty convenient because, in theory, you can buy a bigger cooler that won’t be going to waste when packing less food or drinks than its capacity. Load it up completely and you aren’t busting zippers or fighting the bag to cram it all in. And the slightly larger top openings make packing everything in a bit more convenient too. It’s essentially applied the design perks many backpackers have a preference for nowadays to coolers. One thing to watch out for with the rolltop/dry bag design is that it’s not watertight. If you bring it to the beach one day and knock it over on its side, it’ll likely be just fine. But packing it in your truck or storing it anywhere upside down for a period of time will actually leak water over time. Aside from that, there’s no dedicated storage or separate waterproof compartments in this pack so it really can only serve as your cooler. It’s not meant to be a backpack for your gear and a cooler all in one. But the reality is having a backpack cooler is still a hundred times more convenient than a conventional cooler based on portability alone. So long as you’re not sacrificing the functionality of actually keeping your beer cold, count it a winner. And this is a cooler that seems fully capable of accomplishing just that. Find more from ICEMULE here.